With growing competition in restaurant and food business, it is tough for a restaurant to prosper. People who own a restaurant are looking forward to implementing different effective marketing strategies to get in the top and also to attract more customers to their business. 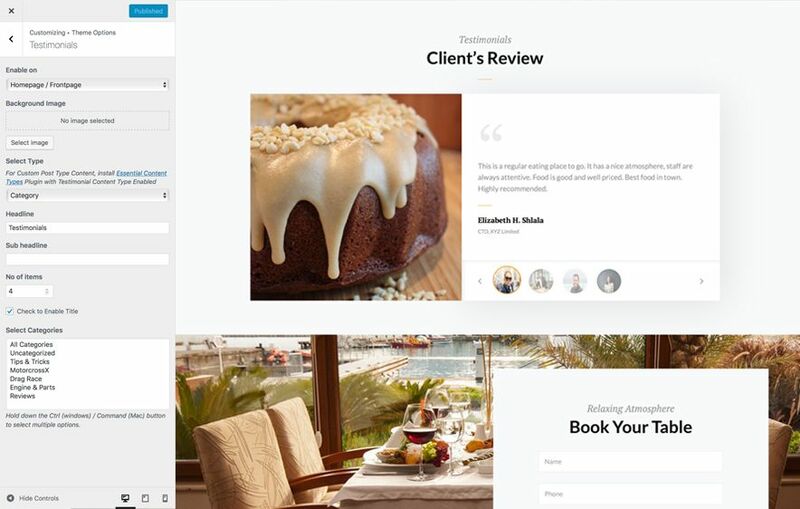 One of the efficient ways to drive more customers to the business is creating an attractive and engaging restaurant website. A beautiful and well-organized website can be a great opportunity to reach out to your target market. Having a website is crucial in promoting your restaurant since a lot of people will check out the restaurants business before visiting the actual place. 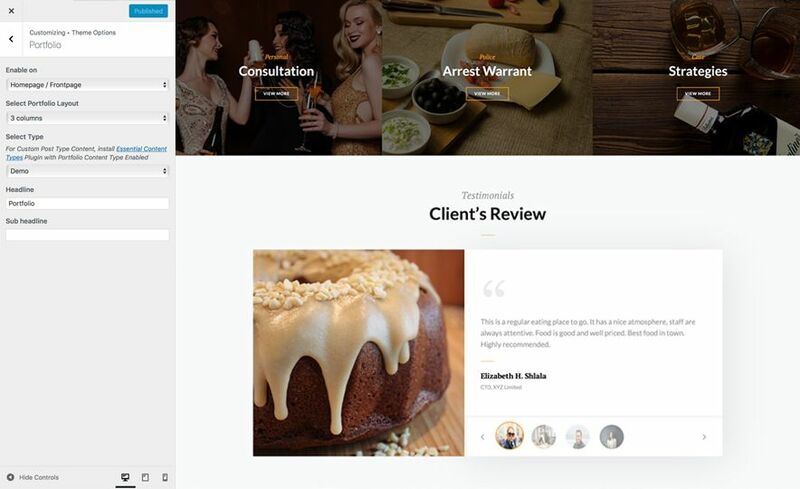 To create an elegant-looking website for your restaurant, you will have to find a perfect WordPress theme that provides you with amazing features for a striking website. 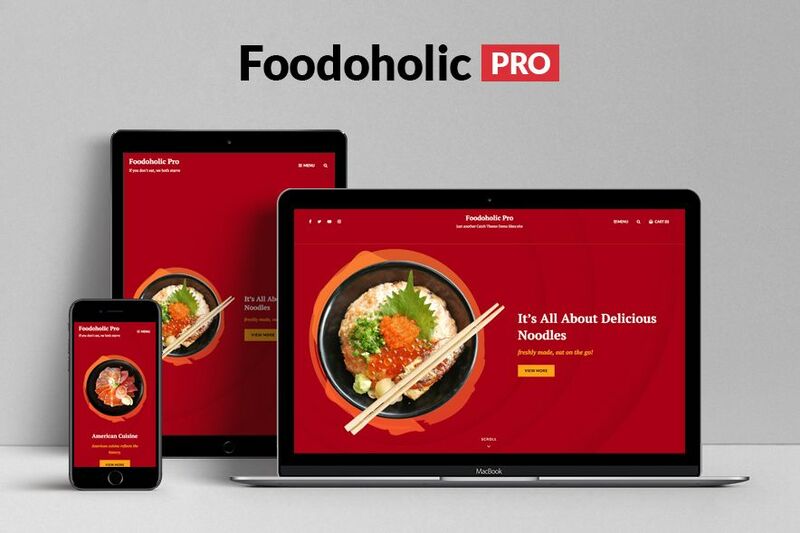 Knowing the importance of restaurant websites, we are very happy to announce the release of our new multipurpose restaurant WordPress theme, Foodoholic Pro. Foodoholic Pro is a clean and simple multipurpose restaurant WordPress theme that comes with incredible features and captivating design to put your food first. The theme has been developed to be a high performance theme that delivers nothing but the best. Foodoholic Pro has a welcoming and engaging appearance with a visually appealing look and simple menu pages. It is a very sleek and attractive multipurpose restaurant WordPress theme which is perfect to show off your cuisine on your website elegantly. Foodoholic Pro is completely responsive and your website will look perfect on all devices. 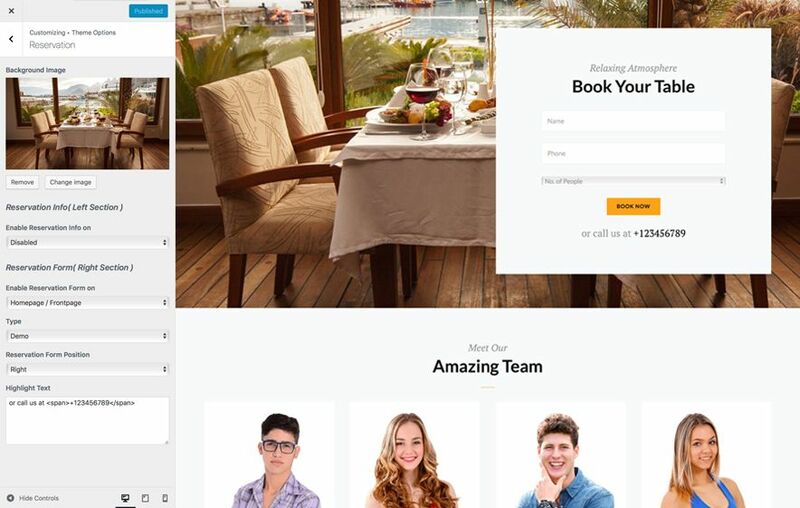 The theme comes with basic features such as –contact info, events, food menus, gallery, header top, menu options, portfolio, promotion headline, reservation, sections sorter, stats, testimonials, and more –that are essential to creating delicious-looking restaurant website. Our new Multipurpose WordPress theme for restaurants is polished and professional and has nearly all the features you will need to create and run a successful restaurant website. 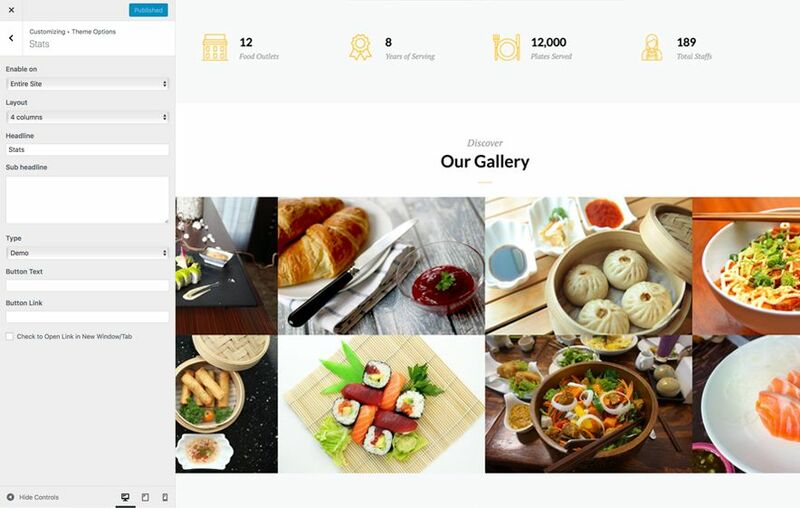 The theme carries all the functionality you need to introduce your delicious menus, your engaging galleries of your meals or ingredients, and much more. You can quickly and effortlessly create your own aesthetic-looking and eye-catching modern restaurant website. Foodoholic Pro provides you the option to display your business information with the Contact Info section. You can display your restaurant’s information on the entire site or on the Homepage/Frontpage of your website. You can add a fitting title with a short description. 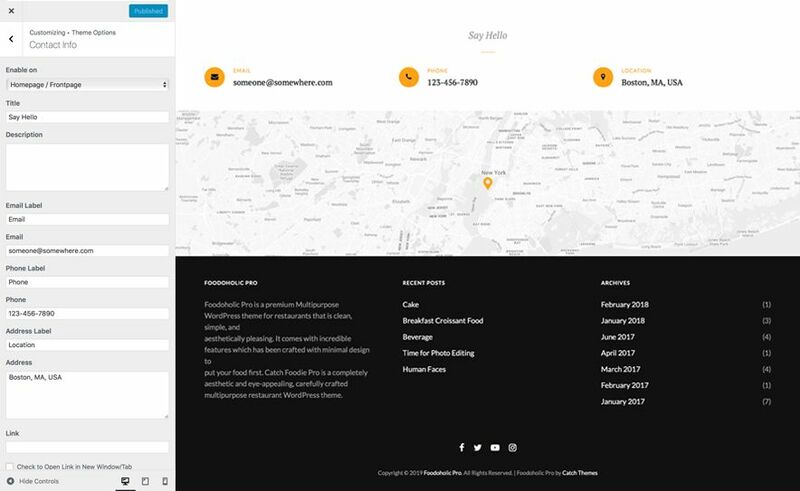 The Contact Info option allows you to add your email address, contact number, and your address along with a map to display on your website. With the Events option, you can add the events happening around you or the ones that you want your visitors to know about. You have the option to choose the Content Type –Post, Page, Custom or Category. Foodoholic Pro provides you the freedom to display your food menu in an elegant way. 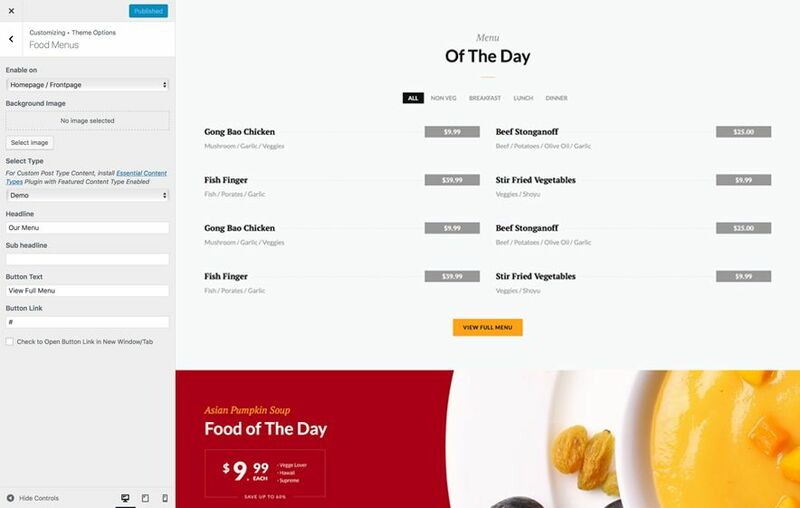 You can display your food menu on the entire site or on the Homepage/Frontpage of your website. You can choose the Food Menu type, add your headline and sub-headline, button text, and more. Display exciting dishes galleries on your website with the Gallery option in Foodoholic Pro. You can enable the Gallery option either on the Homepage or the entire website. You have the option to choose the Gallery Type –Post, Page or Category. Choose the type you want and showcase your mouth-watering dishes to the world at large! The Header Top Section is a small section just above the header. It allows you to add your email address, contact number, and address to display on your website. You can also take it as a shortcut section on your website to help your visitors know more about you and your work more quickly and efficiently. Also, you have to option to enable the Header Top option either on the Homepage/Frontpage or the entire website. 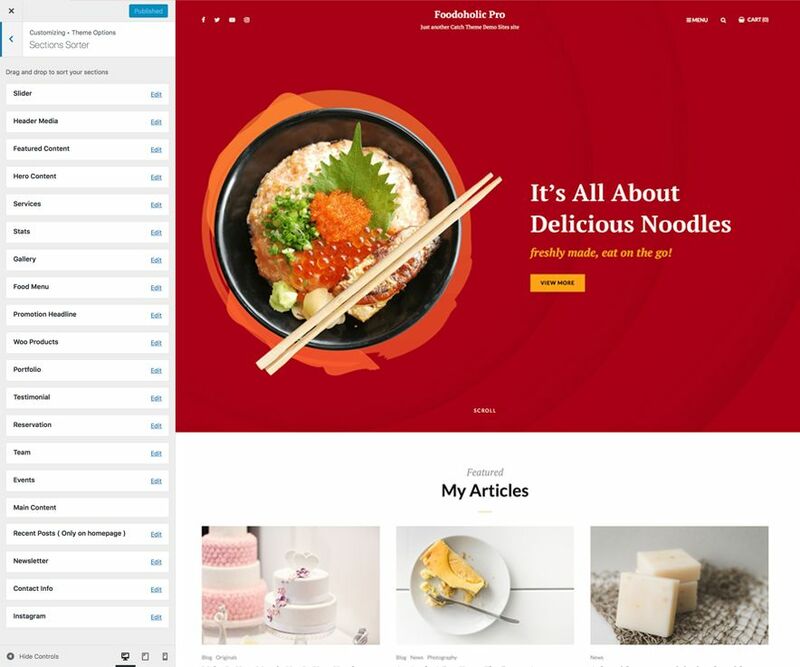 You can improve your website’s navigation with the 2 menu options—Classic and Modern—that is packed in Foodoholic Pro. Nowadays, most users prefer mobile menus even in their desktop computers and if you’re one of them, you can choose the ‘modern’ menu option. However, if you like the old-school style of menu, then simply switch your menu option to ‘Classic’. Showcase your professional skills and accomplishments to the world at large with the Portfolio feature. There are several customization options in the Portfolio section in Catch Fullscreen Pro to showcase your expertise elegantly. 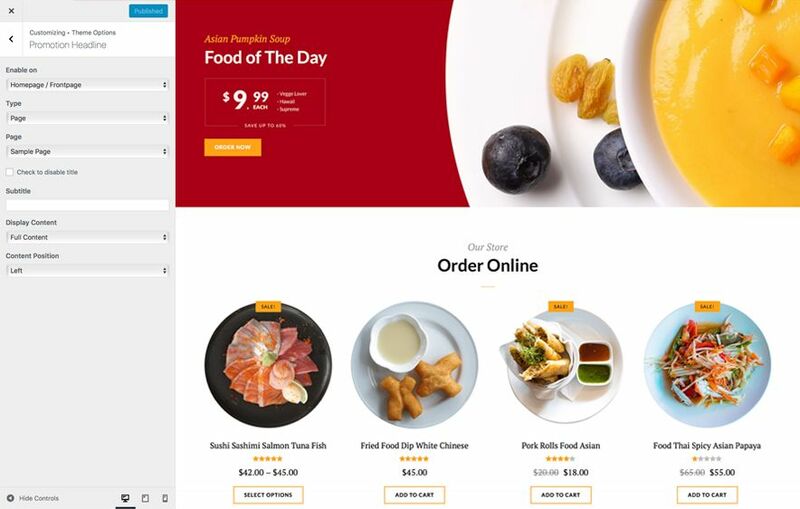 You can choose up to 4 columns to showcase the best works on your front-page or entire website with our new multipurpose restaurant WordPress theme – Foodoholic Pro. You also have the option to select Headline and Sub Headline to show on your website. Foodoholic Pro, the new multipurpose restaurant WordPress theme allows you to add a customizable Promotion Headline. You can enable the Promotion Headline either on the Homepage or the entire site. You can choose the content type—post, page, category, or image—that you want your visitors to see. The Reservation option includes two choices –Reservation Info (Left Section) and Reservation Form (Right Section) that you can enable. You can enable the Reservation Information and Form either on the Homepage/Frontpage or on the entire website. On the Reservation Info option, it allows you to add your description title and sub-title, weekday’s title-description, and your contact number. On the Reservation Form option you can enter a form that you want your customers to fill up in order to reserve a seat. The Stats section allows you to display your strengths to your visitors in numbers. Your first-time visitors are likely to build trust in you and your business only after knowing that you’re excellent at what you do, what you deliver and your services are of a top-notch. And, in order to showcase the achievements of your business, the Stats section serves you well. You can display your website statistics in up to 4 columns, add headline and sub-headline along with a few other customization options. Your customers can provide testimonials thanking you and your services. What is more appealing to new customers than seeing great comments about your restaurant on your website, right? Choose whether to place it on your Homepage, or on the entire site. You also have the option to select the testimonial content type along with other customization options as well. Our code is secure and optimized. We do proper data validation and sanitization and follow core theme guidelines. Our developers are active contributors to WordPress theme review and WordPress core. 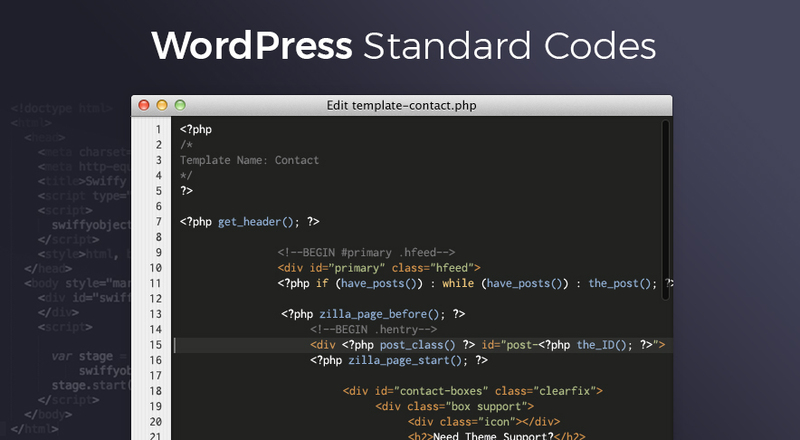 Our themes will always be updated as things change in WordPress. Advanced SEO support has been integrated into Foodoholic Pro—multipurpose restaurant WordPress theme. This allows managing page’s meta-data and heading tags. This is important because SEO optimized pages can help you and other viewers find your site easier on the web. 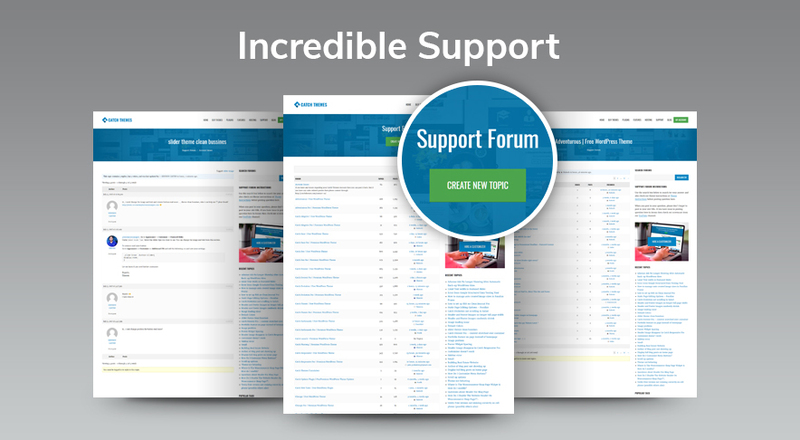 Our support team is well-informed and provide extensive support documentation. For a multipurpose restaurant WordPress theme, our theme documentation answers most questions about using the theme. If you are still having difficulties, you can post in our “Support” forum, and a member of our team will get back to you shortly. You can also hire our theme customization for advanced customization of your theme. To sum it up, Foodoholic Pro is a simple, attractive, and modern multipurpose restaurant WordPress theme for classy restaurants. The theme is extraordinarily stunning, aesthetic, and eye-appealing which is perfect to show off your cuisine on your website elegantly. 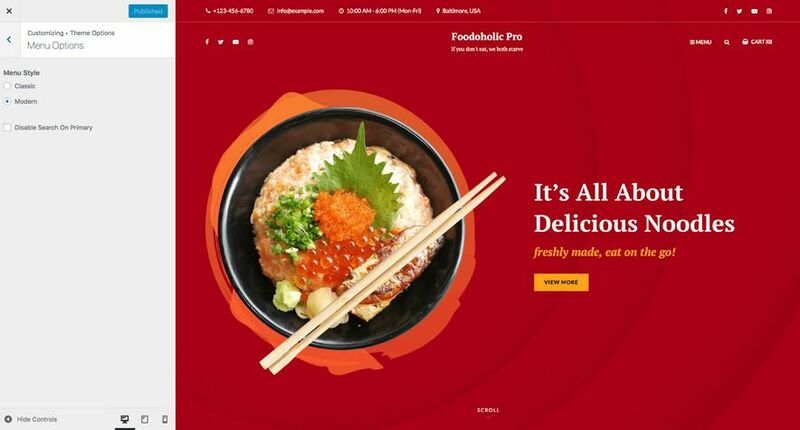 Foodoholic Pro is a great choice if you want to create an elegant-looking website for your restaurant. The theme comes with minimal design and all the crucial features needed to build a website of your desire. The fully responsive layouts work perfectly on any screen size. 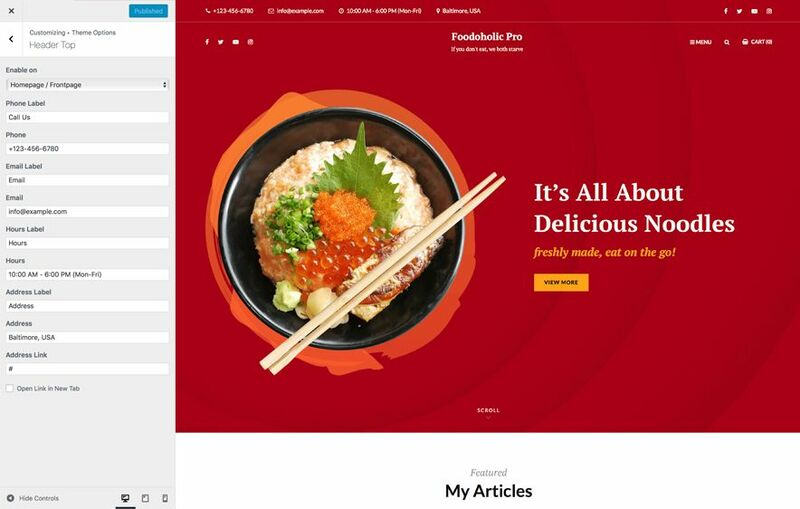 So, if you’re in the hunt for a great WordPress theme for your website to show off your restaurant, then Foodoholic Pro is the perfect one to go for. Buy our new multipurpose restaurant WordPress theme – Foodoholic Pro now! Check out the live preview of Foodoholic Pro. We also have a free version of our new Multipurpose Restaurant WordPress theme that comes with amazing features. Click here to check out Foodoholic.